One of the cheapest ways to keep your home or business comfortable is by doing a ceiling fan installation. If you don’t already know, ceiling fans come in a variety of designs and shapes to match any home interior. During warmer periods, having a ceiling fan installation that’s correctly done helps to circulate heat and air movement that helps to keep your rooms more comfortable for the inhabitants. 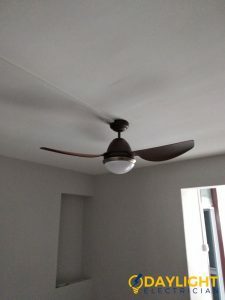 Can I Install A Ceiling Fan By Myself? Most people do not feel comfortable doing ceiling fan installations by themselves. 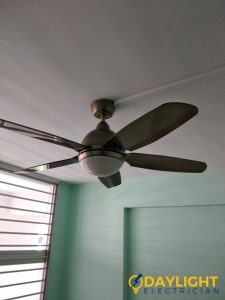 This is because it involves high voltage electrical wirings, as well as some skill in carpentry to ensure that the ceiling fan is correctly mounted and work at heights which can be dangerous when carried out by an inexperienced person. 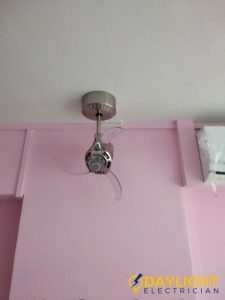 Ceiling fan installations in Singapore typically also need a new electrical box to be installed on the roof. 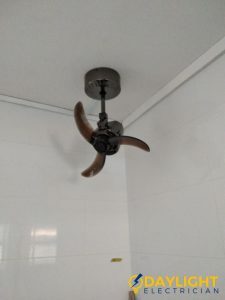 If this is not done correctly, it could be unsafe and can cause serious injury if it falls off because of the weight and the constant movement of the fan. Unless you are an EMA –certified electrician, we do not advise that you install a ceiling fan yourself. 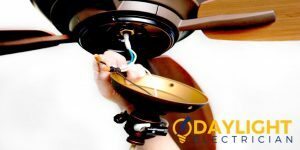 Why risk your safety when you can rely on an EMA licensed electrician from Daylight Electrician Singapore to handle your ceiling fan installations? 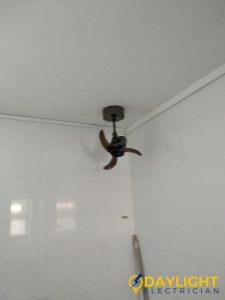 We are reliable electricians specialising in all types of ceiling fan installation services in Singapore. We ensure that all ceiling fan installation projects that we do are correctly wired and mounted. Do you have an old ceiling fan that is not working properly or at all? We also do ceiling fan repairs and replacement. For your commercial building projects, we can recommend high-quality ceiling fans and not typically installed, cheap ceiling fans that easily break. We will install your ceiling fans safely for your office complex or commercial building using premium electrical wiring at reasonable ceiling fan installation costs. There are many homeowners who prefer to carry out ceiling fan installations by themselves. 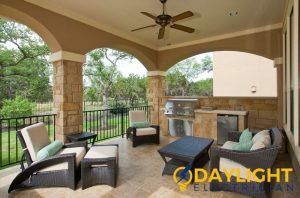 While this may seem complicated to most people, some homeowners who have basic electrical knowledge can easily follow a manual and do the installation themselves. This remains a practical option for them in order to avoid electrician costs. However, it is always better to engage in the services of professional electricians in order to avoid future problems. Firstly, carefully measure the slope of the ceiling where you’re planning to install the ceiling fan. The height of the ceiling from the floor should be measured as well. These are needed in order to correctly calculate the ideal measurements required for the ceiling fan to operate. 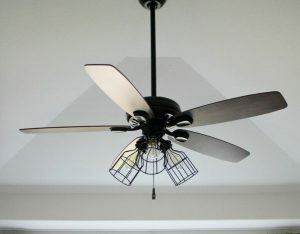 The length of the down rod and the diameter of the fan blades should also be determined prior to buying a new fan. Switch off the power supply from the mains to avoid any accidents during the ceiling fan installation. There should not be any other fixtures near the chosen point for the fan installation. The outlet box should also be marked to provide support to the vertically hanging ceiling fan. Remember, the installer should carefully read all the instructions and warnings written in the manual given by the ceiling fan manufacturer. Prepare the necessary tools needed for the ceiling fan installation. The tools usually required are a cordless drill, an adjustable wrench, wire cutters, screwdrivers, pliers, tape, safety glasses and a ladder. Carefully decide the position of where you want to install your new ceiling fan. This is because the blades of the ceiling fan should be at least 7 feet above the ground and 10 inches below the ceiling to ensure a smooth operation. Moreover, the ceiling fan should be far away from the walls, doors, wall cabinets, or any other feature to avoid collisions. 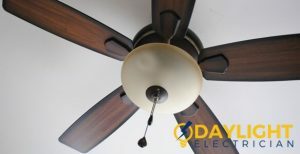 If any previous ceiling fan or light fixture were installed on the chosen spot, the existing electrical feature and the electrical box should be opened with a screwdriver after switching off the power supply. Clean the spot and make sure it is free from dirt before installing the new ceiling fan there. 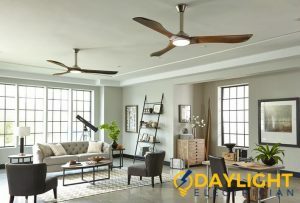 Professional electricians such as those from Daylight Electrician Singapore should be aware of the procedures required when installing a ceiling fan where a light fixture exists. The mounting bracket should be installed on the outlet box of the ceiling fan with the help of the screws and other fixing materials. The electrical wiring of the ceiling fan should be installed on the mounting bracket in which the motor of the fan needs to be attached. But don’t fret, as licensed electricians should know how to install ceiling fan wirings. Next, the motor of the ceiling fan needs to be assembled and attached to the down rod of the ceiling bracket by connecting the wirings with the wire nuts. Wires of the same colour from both the fan body and the receiver should be connected together. This is done in order to complete the circuit of electrical wiring for the ceiling fan operation. 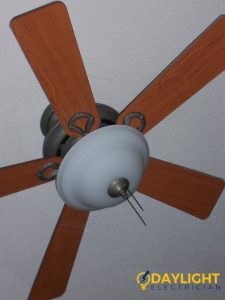 The canopy of the fan body should be screwed onto the mounting bracket of the ceiling fan. Lastly, the fan blades should be attached to the fan motor by inserting the grommets on the holes of the blades while fasting it to the motor’s body. Can you install a ceiling fan by yourself? As mentioned earlier, you can always try to install a ceiling fan by yourself, given that you have sufficient electrical knowledge and experience. 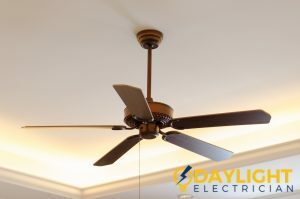 However, a professional service provider knows the nitty-gritty details required for a ceiling fan installation work and this is why it is important to engage in their electrical services if possible. 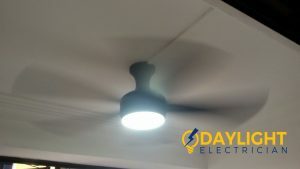 If you’re looking for a reliable electrician with reasonable ceiling fan installation pricing, then Daylight Electrician Singapore is the company to call. Ceiling fan installation cost varies depending on the type of fan to be installed as well as where it will be placed. Just contact a trusted electrical service company for quotations. Can you get old fans repaired or even reinstalled? Fan repair services in Singapore are easily available. Get your faulty or damaged ceiling fans fixed in no time by calling a reliable and certified electrician. Once your ceiling fan starts functioning properly again, you can ask your electrician to carry out a ceiling fan installation. Do your research first before getting a ceiling fan installation done in your home. This is especially important because there are various types of fans available in the market nowadays. Not only do they differ in brands, but also in features, shapes, and functions. Find a fan that will cater to your needs and lifestyle as closely as possible. If you live in a landed property, do consider getting a ceiling fan installation installed outdoors. This is a wise and practical choice if you have a garden or a patio. Having a ceiling fan installed in such places will be sitting and relaxing outdoors more comfortable especially in Singapore’s hot climate. Since ceiling fan installation costs are usually more affordable than air conditioners, you can opt for as many ceiling fans as you prefer. Our team of highly dedicated and reliable electricians is equipped with the necessary skills to conduct ceiling fan installation services. 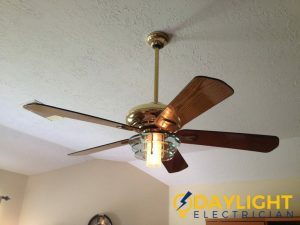 They will personally visit your home or office and assess your unique situation then recommend a personalized solution for your ceiling fan needs. All our electrical services are backed by a 30-day full warranty so you can be rest assured that we will provide you will top quality after-sales support. Contact our friendly staff today by calling us at +65 6653 6261 for a no-obligation consultation or sending an email to enquiry@daylightelectrician.com. We will have a trained electrician assist you with your ceiling fan installation needs. While you’re at it, do browse through our positive reviews!